Also, I've been searching online and talking to some of the parts retailers in Europe regarding this brake booster. I also reached out to ATE in Europe and North America to see what they would have to say, since they make the part. ATE in Germany forwarded my request internally, but I never heard back. I called ATE North America and all they could tell me was that the part is discontinued. 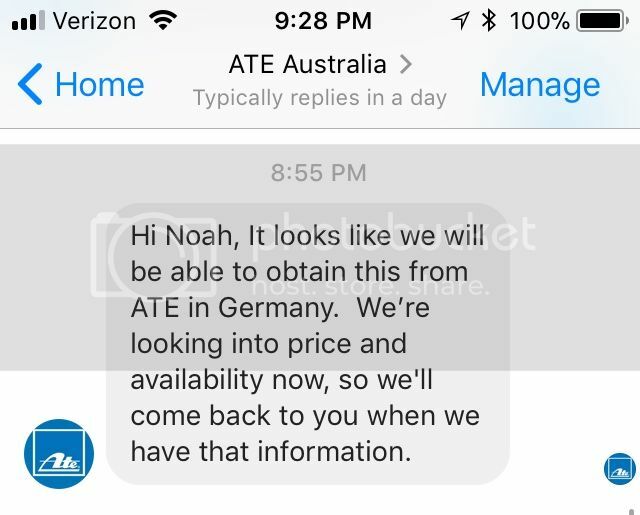 I also reached out to ATE Australia on Facebook because, why not and it's often more direct than an email going into some customer service blackhole. They initially asked me to call them, but I wasn't going to bother (it's 2017 - use the phone? LOL) so I just gave them more information into the problem via Facebook messenger. It's now the weekend there, so I don't expect to hear back for a couple of days.